Did I Ruin Your Life? Salt: More Like Womb Raider, Amirite? Who's Behind Tim Eyman's Big New Tax Initiative? A little company called BP. Yeah, that BP. Perhaps you're familiar with their work? How Can Neutralizing Antibodies Defend Against HIV? Tron Sneakers: Condemn or Allow? Omitted Rossi: "I think we should"
Photographs in Public Places: What Are Your Rights? 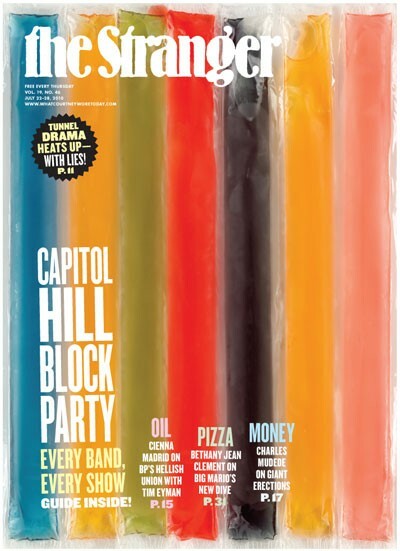 Everything About Capitol Hill Block Party That You Ever Wanted to Think About!!! A Headline That Might Get the GOP To Reconsider Its Opposition to Cap & Trade, Alternative Fuels, Large Federal Investments in Solar and Wind Power, Etc. Music to Listen to Whilst Losing Your Mind! A Beautiful Day in the Neighborhood: Kid(d)s! "Where in town has the best pupusas?" RIP, Silver Lake Walking Man! "You Are Not a LOLcat"
Ken Hutcherson Goes Crazy in a Whole New Way! Is A Party Bus A Sovereign Nation? We Have Free Tickets For You! How Is Terry Radjaw of the Infamous Mad Rad Preparing For His Upcoming Performance at Block Party? Have You Ever Wanted to See a Police Officer Jump Rope? Is the City Council Plotting to Rebuild the Viaduct? Longer Rossi: Repeal Health Care Reform and Financial Reform, and Replace Them With... ??? Word of the Day—See If You Can Spot It! Look Out for That Pervy Inspirational Book! Don't Even Step to Hank Today, You Guys. Everything You've Ever Wanted to Know About Block Party and a Few Other Stuff!!!! US Senate Candidate Alvin Green: The Plot Thickens....with Rap! Do You Know What to Do If a Bear Attacks? Why Didn't Anyone Think of That Before? Should Mel Gibson Be Allowed to Exist? Gawker Says: NO! EXTERMINATE HIM! What the Devil Is This Place? Looking for Something To Do Before Heading To the Block Party Today? Anybody Want To Dig Into This? Re: A Headline That Might Get the GOP To Reconsider Its Opposition to Cap & Trade, Etc. When Creativity and Sustainability Are "Creativity" and "Sustainability"
How to Get a "Scoop"
Are You Going to the Capitol Hill Block Party? Quiz of the Morning: What Is Senior Day at Columbia Center? What Did Chopp Say About the Governor and the Tunnel Overrun Amendment? Re: Charles Mudede Makes an Incomprehensible Post About Drinking at Block Party!!! Who's Backing Tim Eyman's New Initiative? Because We Are: Best Gay Art Show in Forever? Charles Mudede Makes an Incomprehensible Post About Drinking at Block Party!!! How Many Traditional Marriages Were Saved or Strengthened When This Man Lost The Love of His Life and Then His Home? Is It Just Me or Is There Something Very Goofy about the Stage Show for Jack White's Other Other Band? New Things to Know About Block Party Logistics!!! Who Should Dorsol Plants Run Against?